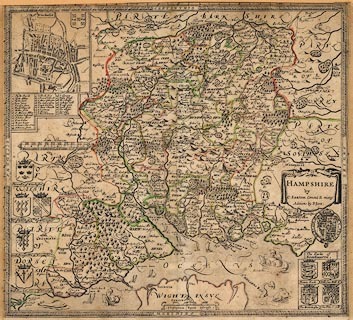 Map, hand coloured copper plate engraving, Hampshire, scale about 4 miles to 1 inch, by Christopher Saxton, engraved by Leonard Terwoort, Antwerp, Netherlands, first published about 1575, amended 1689 and published by Philip Lea, London, 1693. Published in the Shires of England and Wales Described by Christopher Saxton ... With many Additions and Corrections by Philip Lea. The additions to Saxton's plate made by Lea include the coats of arms of the Earls of Southampton, an inset map of Winchester, hundred boundaries, and roads, and scales for an index grid. This is one of the earlier maps of Hampshire to show roads; a selection of those published by John Ogilby, 1675; roads had been added by 1689.